Once again, the story goes on. Basically the same "Vanguard" formula. A new threat arrives, dark plot twist (which in this case, the main character goes missing/is taken into a void). The pacing is painfully slow, and I'm waiting fortnight upon fortnight to see the next big episode only for the characters to repeat the same dialogue, followed by a montage of (an attempt at) suspenseful scenes. There isn't much other context provided but I feel like the series is headed in the same route as the original Vanguard, just without the protagonist. 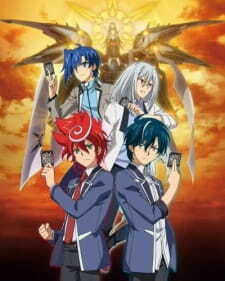 Cardfight Vanguard in general retains the regular Shonen style with wacky hairstyles and colors. The characters have more tall, straight figures. A majority of them. I found this slightly appealing to be fair. But for the most part, it is rather generic and overused. The sound isn't that top-notch, being done by a low-profit studio. They reuse effects from other series to say the least and I feel like some SFX don't really match the performed actions by characters and Vanguard alike. While the series hasn't even begun, I can easily perceive the many ways this anime is about to go with the opening episodes. Unless the writers decide to intensify the story, miraculously, I don't see this series going any differently from about most other Vanguard series.